Tens of thousands of Russians have flooded Moscow's tree-lined boulevards in the first big protest against Vladimir Putin since his inauguration as president, as investigators sought to turn up the heat on the opposition by summoning some of its leaders for questioning just an hour before the march. The rally is a crucial test of Putin's approach to the opposition, following the swift passage of a repressive new bill introducing heavy penalties for those taking part in unauthorised rallies. Police searched the apartments of opposition leaders on Monday and called many in for interrogation in what was widely described as a crude attempt by the government to scare the protesters. Leftist politician Sergei Udaltsov snubbed the summons, saying on Twitter that he considered it his duty to lead the protest as one of its organisers. The investigative committee said it wouldn't immediately seek his arrest and would interrogate him later. Anti-corruption blogger Alexei Navalny, liberal activist Ilya Yashin and TV host Ksenia Sobchak all attended the interrogation session, which meant they missed the demonstration. Investigative committee spokesman Vladimir Markin said authorities had found more than €1m (£805,000) in cash at Sobchak's apartment and would initiate a check to see whether she had paid her taxes. Sobchak, the only daughter of a late mayor of Saint Petersburg who was Putin's mentor, had been spared reprisals until Monday's raid. "I never thought that we would slide back to such repressions," she tweeted on Monday. Braving a brief thunderstorm, protesters showed up at Pushkin Square prior to the planned march, and their number grew as they began marching down boulevards to a broad avenue where the rally is to be held. Despite fears of unrest following a violent police crackdown at a previous protest last month, the demonstration went ahead peacefully. 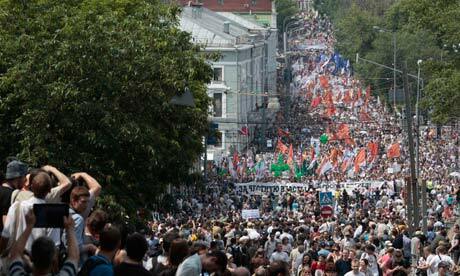 Udaltsov put the number of protesters at 50,000, while police estimated about 18,000 showed up. "Those in power should feel this pressure. We will protest by any means, whether peacefully or not," said Anton Maryasov, a 25-year-old postgraduate student. "If they ignore us, that would mean that bloodshed is inevitable." Another protester, 20-year-old statistics student Anatoly Ivanyukov, said attempts by the authorities to disrupt the rally would only fuel further protest. "It's like when you forbid children to do something, it makes them even more willing to do that," he said. The investigators' action follows the quick passage last week of a new bill that will raise fines 150-fold on those who take part in unauthorised protests to nearly the average annual salary in Russia. "I can't predict whether I'll leave here freely or in handcuffs," Yashin told reporters before entering the investigative committee headquarters for an interrogation. "The government is doing everything possible so that I don't end up there [at the protest]." The top Twitter hashtag in Russia on Monday was "Welcome to the Year '37," a reference to the height of the purges under Stalin. Tuesday's protest has city approval, but any shift from the agreed location and timeframe could give police a pretext for a crackdown. Sergei Parkhomenko, a leading journalist who helped organise the protest, said the authorities would like to see unrest to support their criticism of the opposition. "They would be happy to stage some kind of provocation to prove that the people are just a herd of animals and the animals are always out of control," he said. The previous big opposition rally, a day before Putin's inauguration in May, ended in fierce clashes between police and protesters, and some opposition activists said the violence was provoked by pro-Kremlin thugs. The raids of the opposition leaders' homes and their questioning was connected to the 6 May protest. This article was published on guardian.co.uk at 08.08 EDT on Tuesday 12 June 2012 . It was last modified at 08.38 EDT on Tuesday 12 June 2012 .